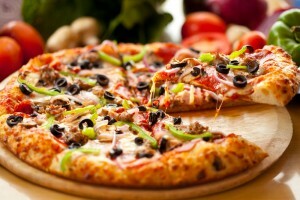 If you like pizza, you may have wondered why some pizza simply tastes better than others do. Even when you eat a pizza that doesn’t have your favorite topping, it may taste better than a pizza from another place that does have your favorite topping. In all likelihood, the better pizza was superior for specific reasons. There are three things that are fundamental to making a great pizza. Any connoisseur of pizza knows that a great pizza starts with the crust. When you bite into the first slice of a pizza, you know immediately whether it is going to be a good pizza or not by the crust alone. The crust should never be overcooked, making it overly crispy, but it shouldn’t be undercooked either, making it difficult to take a bite from the slice. A perfectly baked crust is made by using quality baking techniques. A great pizza is going to have a homemade sauce and not something that comes from a can. A homemade sauce will have a rich tomato flavor that adds to the texture of the crust, producing the foundation for any great pizza. Although the specific ingredients used to make a good pizza sauce are a matter of taste, it all begins with a freshly made batch of homemade sauce. This is critical for a pizza to be great. Even with a great crust and homemade sauce, a pizza is easily ruined by canned or stale ingredients. All the ingredients need to be fresh to create the most flavorful pizza possible. Such toppings as mushrooms and pineapple should always be supermarket fresh. The cheese used for the pizza should never be of the processed variety, but freshly shredded prior to making the pizza. If you love pizza, then you owe it to yourself to start looking for the best pizza in Las Vegas, pizza restaurants that make their pies with the above three things in mind. Once you find a restaurant like this, you should frequent the restaurant and you will be assured of getting great pizza every time you order.